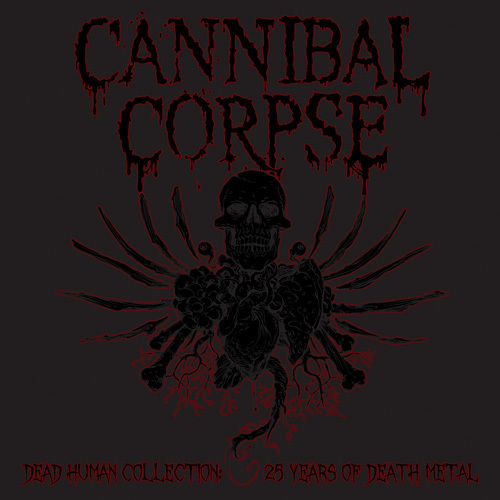 CANNIBAL CORPSE to release ‘Dead Human Collection – 25 years of Death Metal’ boxset in Europe! 2013 marks death metal juggernauts CANNIBAL CORPSE’S 25th year as a band and CANNIBAL is going to celebrate it all year long! The logo has been updated to reflect the monumental occasion and will be used on all things CANNIBAL, from merch to packaging, throughout 2013. The packaging will be a high quality hardcover book in LP format with an at least 8-page booklet, new artwork, yet unreleased photos and liner notes. Dead Human Collection – 25 years of Death Metal will be released March, 29th/April, 2nd via Metal Blade Records in Europe! In addition to the updated logo only being used this year and the box set, Metal Blade Records will be releasing one picture disc a month from the band’s expansive catalog. A total of 12 pictures discs will be released, covering all of the band’s full-length studio albums, some of which have never been released on picture disc. Check back HERE each month to get a glimpse of the next picture disc available for preorder. CANNIBAL CORPSE is currently touring Europe!